A man who learns a sad and painful lesson. Billy forgot to go to his father’s funeral. He was so preoccupied with his newly growing business that everything else was less important to him. “He was your father,” Billy’s mother reminded him. They hung up because Billy needed to hurry. He was meeting his boss, Mr Wood, who was the one that got him to the position where he was. “You must never forget people who get you places,” Mr Wood replied. Billy looked at his boss, puzzled. “He always knew what career you wanted. So he was incredibly dedicated to helping you. He sent a thousand, maybe two thousand letters all over the world, promoting you. He told everyone he could, how dedicated you were and how much you were willing to work hard. He even went on foot and knocked on doors to tell people about you. Billy swallowed hard, and tears gathered in his eyes. “Excuse me,” he murmured and left his boss’s office. When he was out on the street, he ran. He ran out of the centre, straight to the graveyard where his Dad was buried. 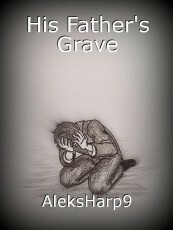 When he found the grave, he dropped to his knees and cried uncontrollably. He cried all day, and he didn’t move from the spot. An old woman who cleaned the gravestones limped towards him. Oh, that last sentence -- excellent. A great message in a well-written story. good one Aleks, somehow i can relate to this too.